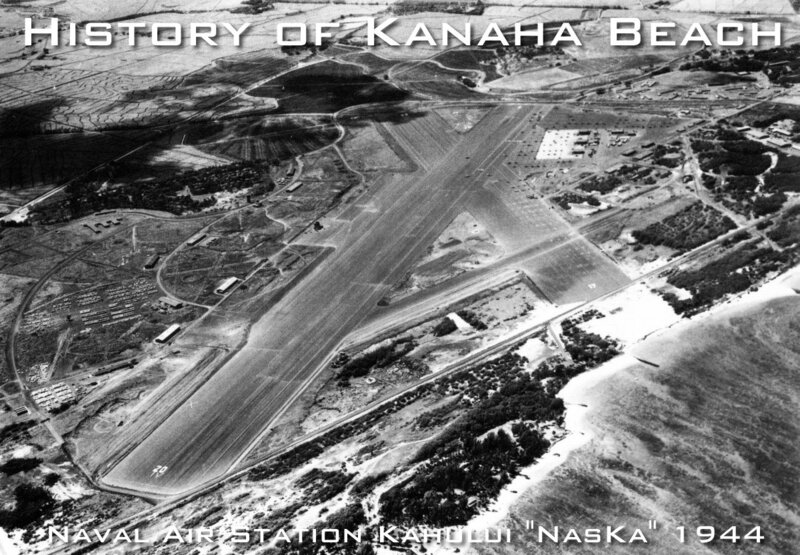 Kanaha Beach in September 1944 (73 years ago). On March 15th, 1943 the Navy commissioned Naval Air Station Kahului on land leased from Hawaiian Commercial & Sugar Co. Three years earlier the Navy had commissioned NAS Pu’unene five miles to the South. Since the December 7th attacks, and the rapid buildups now required, Pu’unene didn’t have the capacity to handle all of the transiting squadrons that needed final combat training prior to leaving for the war zone to the South, thus NAS Kahului was born. Two asphalt runways of 5000 and 7000 feet, plus parking for two carrier air groups were constructed in a little over a year. Many carrier air groups and over 40 different squadrons trained at Kahului during the war. Nearby Kaho’olawe was used for strafing, bombing and torpedo runs and the runways used for carrier landing practice. Over 900 officers and 5,000 enlisted personnel were based at Kahului during the war. (Quote from http://hiavps.com/Kahului.htm). A Maui County Council committee is considering ways to regulate sand extraction in the county in light of a recent Central Maui sand excavation and export case that came under fire from members of the community and Mayor Alan Arakawa. The Honolulu-based concrete production company that has been moving sand from Central Maui to other places off-site, including Oahu, has stopped transporting sand, following a formal notice from Maui County regarding permit issues on Monday. An ornate tree snake was captured by military personnel near the airfield at Hickam Air Force Base on Thursday afternoon, officials said. 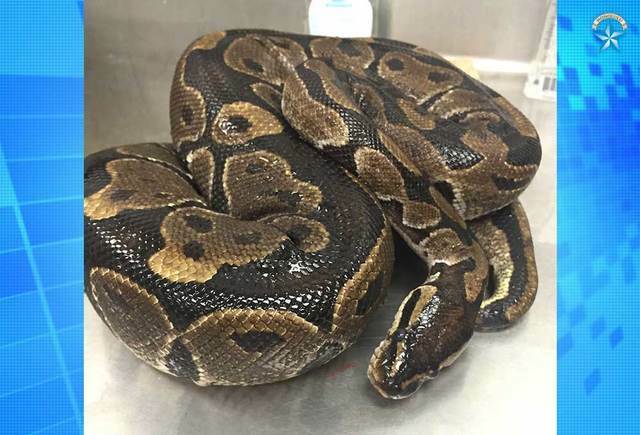 The snake, measuring 3- to 4-feet long, was reported to the Agriculture Department on Maui and a plant quarantine inspector picked it up. It was later identified as a non-venomous ball python. 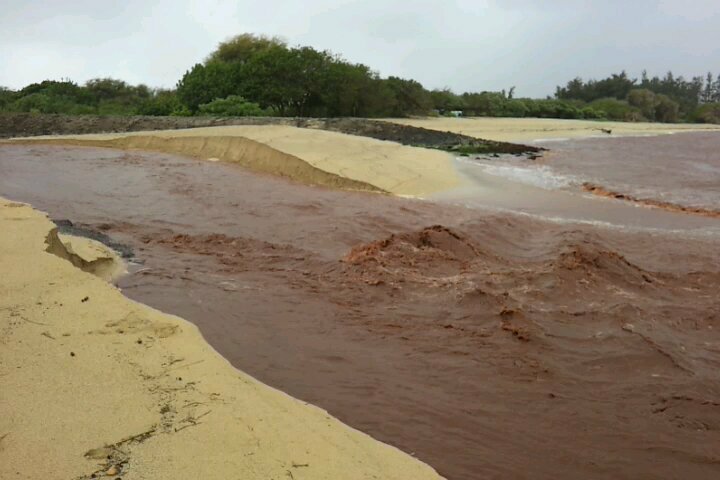 After heavy rains upcountry, the soil and sediment in the upcountry streams gets washed downstream and goes into the ocean. We call these events Brown Water. It can be sunny and dry at the beach, but if it rains heavily on the uphill slopes, then you can get A flash flood, and swift moving water suddenly swells the streams and culverts, and you will get a situation like in the photograph below. It is always possible that this can happen at anytime, so be careful if camping near a stream, or if kids are playing near a stream. Brown-water brings with it the soil, and pesticides, livestock feces and other contaminants. The bacteria in brown-water is potentially harmful to humans, so you should avoid contact with brown-water in streams, and in the ocean. Brown-water is also damaging to coral reefs and marine life too. The pesticides like roundup, used on ag crops and sugar cane fields goes into the streams and oceans and is toxic to plants, algae, and coral. Hopefully in the future better farming practices uphill, and less livestock churning the soil, will help to reduce the occurrence of Brown Water. meanwhile stay out of the ocean too, for at least three days or until the water is clear again. Especially if you have any cuts on you. an never get brown-water into your eyes or nose either. Maui has experienced significant loss of beachfront in the last few decades and the problem is getting worse. The causes are not fully understood. But there is agreement that beach nourishment by sand replenishment is the best way to slow the loss of sand from our beaches. Shoreline armoring just shifts the erosion to the neighboring beaches and shoreline. The two local sources for replacement sand are, mining sand from inland sites, or dredging off-shore areas and pumping a wet slurry of sand-laden seawater back onto the beach. Inland sand mining is cheaper than dredging sand from the seafloor. I have heard that the sand from dunes near Wailuku is mined at a rate of more than 300,000 tons a year, and is mostly shipped to Honolulu to be used in the manufacture of concrete. It is estimated that at the current rate of extraction that Maui’s supplies of inland sand will run out in 5-7 years. Maui needs to keep all of its own supply of replenishment sand. Sooner or later Maui will need this local supply of sand for its own uses including, replenishing the beaches here. When we run out of local sand stocks, we will have to start importing sand from elsewhere at a much higher price. We need our beaches for recreation and to stabilize the shorefront homes and other buildings that would otherwise be consumed by the sea. Please spare a thought for the plight of our beautiful beaches and save our sand before it is too late. Sand Barge being loaded with Maui Sand in preparation to export it to Oahu. 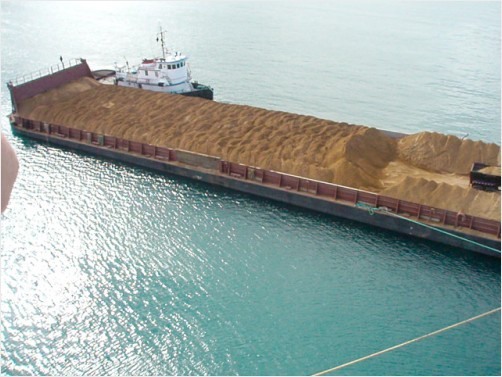 Sand Export is Accelerating: The rate of sand export is accelerating and now at least 96 of these barges per year take Maui sand to Oahu, that is about two of these barge fulls per week. *look closely and you can see the back end of a semi-truck on the barge unloading a full load of sand. It is estimated that Maui is losing over 2 million tons of sand that are being shipped out to Oahu each year. Kanaha Beach is known as one of the best places to windsurf in the world. Warm water and reliable trade winds are ideal for this popular water-sport. Kanaha Beach is favored by Maui’s unique geography. The west Maui mountains and Mt. Haleakala form a valley that is perfectly aligned to funnel the trade-winds blowing from the North east. The trade-winds become squeezed along the north shore and into the Kahului bay, this makes the wind stronger at Kanaha Beach and from the ideal direction. Maui is lucky to have a Kanaha Beach that is blessed with so many natural assets. When you come to Kanaha Beach you will see the beginners learning in the light morning winds in the eastern cove, and then at 11am and afterward the experts come out to play. Kanaha Beach is an excellent place to see all levels of windsurfing, beginner to expert on display. The Sport of Windsurfing: Windsurfing was a sport that was invented by Hoyle Schweitzer and Jim Drake in 1967. It quickly became a worldwide phenomenon. Early adopters of the sport were the Hawaiians, with year round wind and warm water Hawaii was a natural place to practice the sport. Hawaii had no shortage of accomplished water-men (and women) ready to try the sport. Hawaii has produced many icons of the sports, legends, and many world champions. Some names are legendary, and have become industry icons. With millions of participants worldwide, and now an Olympic sport, Windsurfing now is an international sport with competitions in multiple windsurfing disciplines, and world tours, as well as a recreational market as well. Windsurfing has now been around for about 50 years and is now often a family affair. Especially at Kanaha Beach you can often see several generations windsurfing together. Windsurfing is now a family sport, and we sometimes even see three generations sailing together at once. Professional Career Opportunities: For as few dedicated windsurfers, there is the opportunity for the career path of a professional athlete. Maui has a great representation of professionals at every level of their career. Even at Kanaha Beach we have a large community world class professional windsurfers, active and semi-retired, and many current up-and-coming athletes. This makes Maui an ideal environment for creating and training athletes. Stiff competition, mentoring, and professional level sports specific fitness training, gives Maui windsurfing athletes a great advantage. Maui windsurfing legends: Maui’s best known windsurfer is Robbie Naish, a 13x world windsurfing champion, who is also famous for his company Naish International based on Maui that make some of the worlds best water-sports equipment. Pete Cabrinha, who designed his own brand windsurf gear, and his name is associated with top brands. Maui legends include, Francisco Goya, Jason Prior, Dave Kalama, Rush Randle, Mike Waltz, Laird Hamilton, Jason Polakow, Josh and Jason Stone, Mark Angulo, Josh Angulo, Rhonda Smith Sanchez, Kevin and Matt Pritchard, Sean Ordonez, Jenna de Rosnay, Fred Hayward, Alan Cadiz, Alex Aguera, Robby Seeger, Phil McGain, and many more. This impressive list can not be simply defined as windsurfing legends, because they are often masters of multiple sports disciplines. Many have created diverse careers including cross-over with other sports, created new hybrid sports, had successful endeavors, and adventures. The Renaissance of Paia Towne: Back in the late 70’s Paia got a boost from the influx of windsurfers coming to Maui to experience the Maui Windsurfing lifestyle and culture, this helped the local economy and allowed Paia town to reemerge as a vibrant and bustling surf town. The surfing lifestyle economy saved Paia. Now as many of the windsurfers are growing more mature and responsible they are creating more long term businesses, including shops, factories, making gear, clothing, and restaurants. This has helped make made Paia a focal point for tourism creating many local jobs and business opportunities for the local community, and attracted other local companies to invest in Paia. Maui Windsurfing Industry: Maui is at the forefront of design and innovation, many of the worlds top windsurfing equipment companies are either based here or design their gear here. This industry provides many jobs and careers for local people, and make an important contribution to Maui’s economy. Maui’s industry depends on reliable year round conditions for developing and testing new equipment. Kanaha Beach is a test bed where new prototypes and products are developed before being sold to the rest of the world. When a new product is ready for the market, you can often see the pro-sailors doing photo shoots at Kanaha Beach, This is when you see a bunch of windsurfers with a helicopter flying close overheard, they are shooting next years catalogue. Equipment testing at Kanaha Beach, is a common occurrence, all the new gear from all the manufacturers is a big deal, magazines and independent gear testers come to Kanaha from all over the world to test the latest ad greatest windsurfing gear. Not only gear made and designed on Maui, but from all over., The gear is out through its paces and thoroughly tested and compered to see which is the best, these results are published in magazines and websites, the results can really help the suggests of the different products as they will be sold to a very discerning world-wide market. Maui Windsurf Equipment Companies: Maui Sails, Naish, Ezzy Sails, Goya sails, Goya Windsurfing, Hi Tech, Simmer Style, S2Maui Sails, DaKine, Sailboards Maui, Angulo Boards, Hot Sails Maui, Nelson Factory, Quatro Windsurfing, Tectonics Maui, SOS Shapes, Goya Windsurfing, Maui Fin Company, Black Project Fins, Naish Windsurfing. Maui Summer Race Series; is the longest running windsurfing competition in the US. Maui’s beaches are losing sand: Maui native sand has taken tens of thousands of years to form, and has been lost through direct human activity at an alarming rate. Sand mining has occurred since before WW2. Sand mining operations at Spreckelsville area saw the digging out of precious coral sands from the local beaches, to feed the HC&S lime kiln near Paia for about 70 years. A huge amount of Maui sand is mined from inland sand dune stocks too, and the majority is exported to Oahu for cement production. Over 70% of Maui sand mined is sent to Oahu. Read more about the sand issues on Maui here.